Made for the SoundTouch 300 soundbar. Connects wirelessly with a range of up to 30-feet. Solid construction with premium glass-top panel. 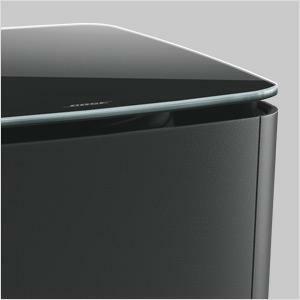 Adds deep bass to the Bose SoundTouch 300 soundbar. Built-in amplifier. QuietPort technology enhances bass response and virtually eliminates distortion. Mini jack input for optional wired connection to SoundTouch 300 soundbar. Get ready for the real thing. Big explosions in your favorite blockbuster films. Sweeping storms. Drum solos. They all come to thundering life with the Acoustimass 300 wireless bass module. Designed as a complement to the Bose SoundTouch 300 soundbar, the Acoustimass 300 wireless bass module delivers rich, resounding bass in a compact form, so you can immerse yourself in dramatic sound effects and further enhance your music, movies and TV shows. QuietPort technology and a highly advanced DSP virtually eliminate distortion and deliver surprisingly clean, deep bass from such a small module. And with an elegant design and tempered glass top, the module looks as good as it sounds. Deep, resounding bass helps propel music and lends more impact to music, movies, TV shows and games with dramatic sound effects. The Acoustimass module delivers it all, even if placed out of sight. 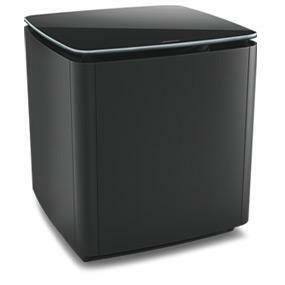 Big thundering bass doesn’t have to mean big clunky speakers. The inconspicuous and elegant module is designed with tempered glass to make your system look as good as it sounds. 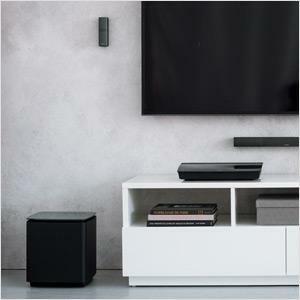 The Acoustimass 300 connects wirelessly to the SoundTouch 300 soundbar, so it’s easy to set up and enjoy in minutes.